Then Gurujee talks about what it is to be a true renunciate. Jae aasaa andhaesaa thaj rehai – what do you have to give up? Do you have to give up your house? No! Do you have to give up your family? No! Do you have to give up your clothes? No! What do you have to give up? You have to give up your aasaa – your hopes and desires and your andhaesaa – your anxieties, give up your hopes and desires, give up your anxieties and what bhikhiaa do you receive? What alms do you beg for? Guramukh bhikhiaa naao – the alms that the follower of the Guru begs for is the naao – is the name of the Guru. That is the true renunciate. Then what does Guru Amardaasjee says? What does Naanak do? This kae charan pakhaaleeahi – Naanak washes the feet of such a renunciate. Ho balihaarai jaao – He is a sacrifice to that renunciate who has given up hopes, fears, desires, anxiety and who has absorbed him/herself into begging for the charity of the naam from Akaal Purakh. This part of the shabad can be understood in many ways. One understanding can be this: O Naanak this world is a tree – tharavar and fal dhue – there are two fruits that hang from this tree and there are 2 birds – pankhaeroo, what this means is that this world is like a tree, this world is the tree, pain and happiness are the two fruits which hang from this tree. There are two parts of the soul, which Gurujee is talking about – which are the birds. One part of the soul bahu range ras bhogiaa – one part of the soul enjoys all these pleasures, all these colors of the world but does the other part of the soul do? Sabadh rehai nirabaan – the other part of the soul remain unattached and remains attached to the shabad of the Guru. So Gurujee is describing two parts of our soul, the one part which goes towards our soul and the one part which is inside us which is begging for the naam. In the last line of this mehalaa Gurujee says, that soul, that being who is har ras fal raathae – who is raathae – who is imbued and absorbed in the fal – the fruit, the essence of Waheguru, of Naam, of Hari, Guru Amardaasjee says karam sachaa neesaan – that soul has the sachaa neesaan – has the insignia, has the symbol of God’s grace shining upon him. Karam in this case means grace. That soul has God’s grace which enjoys the fruit of God’s name. Guru sahibjee Himself is the field, apai hai raakhak – Waheguru Himself is the farmer, Waheguru Himself is the one who grows the corn and grinds it down into flour. Waheguru Himself cooks the corn, aap bhaaddae dhaee parosai - Waheguru Himself puts out the dishes, lays them out on the table, aapae hee behi khaavai - Waheguru Himself sits down to eat what has been made. Aapae jal - Waheguru Himself is the water, aapae dhae shingaa - Waheguru Himself is the one who gives the toothpick, shingaa is a type of toothpick which is used in Punjab. Aapae chulee bharaavai - Waheguru Himself fills up the water for people to wash out their mouth after eating. 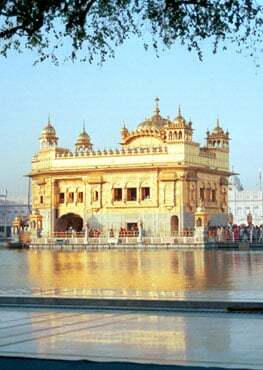 Upon that person, whom Waheguru Himself, upon whom Hari Himself kirpaal hovai – blesses with His mercy this no hukam manaavai – that person walks according to the hukam, according to the will of Waheguru. So Gurujee has covered a vast range of topics starting with talking about renunciation and then going on to the soul bird which is inside all of us – the two halves and then in the end Guru Sahibjee is talking about Wahegurujee’s will and has blessed us with the understanding. Only those people who are blessed by Guru sahib grace can walk on the path of His will.